At the recent session of the Supreme Council Southern Jurisdiction, Sovereign Grand Commander Ill. Ronald Seale, 33°, announced that the Southern Jurisdiction would recognize the Prince Hall Scottish Rite. At the announcement of the step, the SGC for the Northern Jurisdiction jumped on the bandwagon, agreeing to do the same. The bottom line is that Masonry just got better. The invisible lines that separate Prince Hall Masonry from what many call “mainstream” Masonry are slowly getting erased. Now all we need is a better term than “mainstream” or “traditional” to describe what has traditionally been white Masonry. I guess we will get there. For now, I will be happy with this development. This has actually motivated me to consider rejoining the Scottish Rite. This is a huge development and worthy of support. Freemasonry is rife with groups that wear funny hats. One of the things people say when they learn that I am a Shriner is that it must be cool to drive one of those little cars. Must be, I say. I don’t get to drive them myself. Then they comment on the funny hats Shriners are known for. I have to agree that the fez is a funny hat if ever there was one. This constant conversation about fancy headwear made me want to look closer at Masonic groups that have hats as part of their regalia. However, we are more than lovers of the festive chapeau. We are involved in various groups because of the fraternal connections we develop and the unique flavor of each organization. In addition, all these groups have charitable arms, and the funny hats give the groups recognition, which leads to more donations for charity. 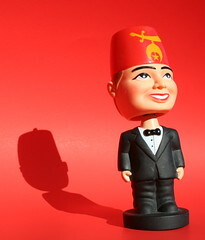 The fez is one symbol of the Shriners, and a continuation of its Near East theme. It is named after the city of Fez, Morocco, where the style of hat first became popular. The Shriners do not use an authentic style of fez, but one that has become popular among Shriners. It is not a required piece of headgear but having one means that you can properly represent the fraternity during public ceremonies, such as parades. This is a photo of my fez, emblazoned with my Shrine temple’s name. I am proud to have it. Probably about half the guys who come to Kena Shriners’ regular meetings wear a fez. The Shriners Hospitals for Children, the charitable arm of the organization, spends more than $2 million per day on critical specialty care for children, without regard for the patients’ ability to pay. This is why I love being a Shriner. The Imperial Potentate sent an email on July 2 about the vote to lift the requirement that Shriners in Arkansas only be Master Masons. There has been mixed reaction to this decision. I am tired of talking about it. Many people think this will lead to the whole of Shrinedom slipping away from any sort of Masonic connection. Some think this has been the plan all along. Others think it is the worst thing that could happen to the Shrinedom and Freemasonry, and even others think it is high time the split occurred. I don’t really mean to be dismissive. I care a lot about this issue. Those of us who care are upset and want to see resolution. I have a preference for how I want this situation to end, but really what is most important is having some sort of sensible resolution so we can all just get on with figuring out what it all means. Presently we are at an impasse. Let’s just figure it out and move on. It is with great sadness I report that the persecution of Shrine Masons continues in Arkansas. We have no way to bring in new members without threat of Masonic Expulsion. This is a death grip the Arkansas Grand Lodge and its Grand Line will have on Shrine Masons for years to come. It could indeed be the downfall of both organizations. Despite the deplorable actions of the Grand Lodge of Arkansas, both Divans of each Temple in Arkansas have maintained the care of their members. Both Temples have also continued to do what is most dear to our hearts – transporting and supporting the Arkansas Children that benefit from “The World’s Greatest Philanthropy” Shriners Hospitals for Children. Attached is a list of Arkansas Shrine Masons that were expelled for doing nothing but being Shriners and helping children. I was recently asked to join a local Allied Masonic Degrees council and was excited to do so. I had never before been invited to an invitational body, so I see this as quite an honor. The AMD is a group I am still trying to get my head around a little. The basis of the organization, it seems, is something very much like a research lodge. Members are encouraged to write research papers on various Masonic topics and present them in the meetings. I am involved in a research lodge here in northern Virginia, and this sort of thing was what excited me early on in my Masonic career, so I look forward to getting more involved in the AMD as well. The part that is confusing is that the AMD is also the owner or caretaker of several side degrees that used to be conferred under craft warrants in regular lodges, mainly in England, as I understand. However, even though I have not had any of those other degrees conferred on me, I am still a full member of the Council. It appears that the AMD perpetuates these degrees so that they do not simply disappear due to an aging membership and lack of new conferrals. I think this is wonderful, keeping these traditions alive so people like me can almost fall backward into them and hopefully gain some insight from them. I am still learning but look forward to a long ride with the AMD. I guess I better start cracking the books open so I can present a paper when called upon. I joined the Alexandria, VA Scottish Rite about two years ago at the suggestion of a few people I have a lot of respect for. The degrees were impressive and the educational program – the Master Craftsman – is in-depth and helped me get a better handle on the teachings of the degrees. The Rite has 29 degrees, and each offers enough learning to keep a guy busy for quite a long time. However, I decided to demit last year and wanted to discuss some of the reasons. The meetings are on Friday nights, a time I prefer to spend with my family. When I chose to join, Friday nights would have been fine because I did not have anything better to do on those evenings. The format is not one I find lends itself to productivity or efficiency. I dragged myself to the last meeting to support some brothers who had just joined and then remembered the score. We had three bodies meet that night. Open, close, open, close, open, close. Stand up, sit down – over and over again. It seems excessively repetitive and inefficient. A body would open, do introductions, and close, conducting a minimum of business. It seemed very self-congratulatory. I don’t live or work anywhere near Alexandria anymore, so getting out there is tough. I have other issues with this particular valley that I do not care to discuss here, but definitely led me to not be terribly upset saying goodbye. For a number of reasons I simply was not getting my money’s worth out of my $69 dues. I received my demit paper shortly after making my request and have mixed feelings about it. I was looking forward to the Master Craftsman II course and learning more about these rich degrees. I also feel like I am letting my brothers down a bit by not keeping my membership. I do plan to join again, maybe next year. The DC Scottish Rite has meetings the first four Tuesdays of each month, each body meeting on a different evening. They also have interesting programs, some of them looking deeply at the metaphysical aspects of our profession. I understand they always have a good dinner before the meetings too, which doesn’t hurt. What would have been nice is if there were more valleys in the area, thus allowing me to easily choose one that fit my needs and desires, the way you can with lodges. For now I remain unaffiliated as a Scottish Rite Mason but look forward to joining a valley again as soon as it becomes feasible. A few years ago I decided to pursue the Royal Arch but I came to the group in a strange way. My lodge rents the facility to a RAM chapter, so I was familiar with the image of the triple tau but knew little about the group. One night a meeting was called among some of the more active brethren of my lodge but when we got there we found that the building was already occupied by the Royal Arch members. We went elsewhere for our brief meeting but not before I caught a glimpse of some of the men who were there. They were guys I already knew and looked up to and many of the ones I did not know personally I knew by reputation. I decided then that this was a group I wanted to be part of. Since joining, I have learned quite a bit about the order and am enjoying this pursuit. Getting to know the officers and members in my own chapter as well as the area chapters has been interesting because most of them were people I already knew to be masters of the Masonic ritual. Now it turns out that they are also masters of the Royal Arch ritual. Later I learned that they are almost all active in the Scottish Rite as well. Having a grasp on the operations of any one body is impressive enough, but many of the guys I know are experts on more than one level. It is very impressive and humbling. I am barely a master of anything, and I get to sit with these fine gentlemen who are more knowledgeable than I am ever likely to be. So much of Masonry has been like this for me – following people whom I considered mentors, whether they knew it or not, and finding myself part of something surprisingly interesting and worthwhile. My brother (biological brother, that is) had advised me not to join any appendant bodies for at least one year and to spend that time in my mother lodge, learning and getting active. I followed his sage advice but knew early on that I would join the Royal Arch Chapter. This year I am the king of my chapter. It’s different from being Elvis, at least so far, and I am excited about being the high priest next year. That’s when it will really feel like being Elvis!